The Dark Souls 1.05 patch has finally come stateside. It rolled out in Japan a little over a month ago, and it began showing up on North American consoles shortly thereafter. This new patch includes a host of features and fixes, but the most important one for me, and many other players, is an improvement on the multiplayer summoning system. 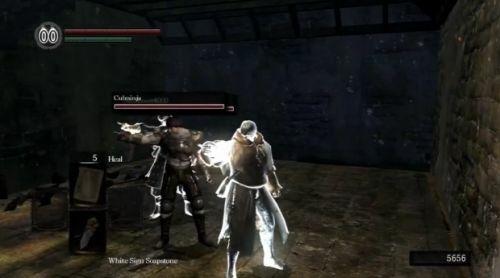 If you've been following the whole Dark Souls co-op ordeal, you know what I'm talking about. Previously, I openly doubted whether any real solution would ever be enabled. After hours of post-patch testing, I'm happy, nay, delighted to report that the multiplayer portion of the game has been fixed. Now before you get too excited, let me explain what I mean by "fixed." The game's summon system has been upgraded to something akin to that of Demon's Souls. There's still no lobby, no party chat, and voice chat is completely absent from the PS3 version, but there are summon signs! Oh, the glorious, numerous, summon signs. Having played through the entire game pre-patch, I can tell you that Lordran was an incredibly isolated place in the later levels. The chances of finding a random player were slim to none in my two playthroughs. When I first reviewed the game it took over an hour and a half to try to coordinate a player summon. Now, with the help of Locke and Sunny, we've tested the new and improved multiplayer and we are very pleased with the results. We can summon each other easily (as long as we are following the rules). Other players' summon signs are abundant. The connectivity has been improved across the board. After 140 hours of gameplay, I was finally invaded by another player. It was awesome! Locke put this fantastic video together showing off the new connectivity. Sunny handled choreography, and I, well, I just looked good. Enjoy! Co-Op Review Score Update: Since Dark Souls now has the same co-op connectivity of its predecessor, Demon's Souls, plus a few other co-op features like Covenants and Miracle Resonance, we've decided to change the game's Co-Op Review score from a 2 to a 3.5. You can see our co-op scoring explanation here. It's not a traditional cooperative title, and you have to jump through some out-of-game hoops to coordinate a game, but at least now it's easier to bring friends, or strangers, along for the ride. Overall, the game remains a stellar experience.